Cats are amazing animals and they make great pets. They offer unconditional love and provide positive energy to any home. Leaving the scratches, spilled food/water or stinky litter boxes aside, the positive things a cat brings in your life are so much more. That is why you should offer your favorite feline friend the best possible conditions for a good life together. Besides love from your part, there are also great things on the market that can assure comfort, activity or relaxing tools. You can find a few suggestions below. Have you noticed that when the food supply is low in the bowl, it begins to scatter towards the edges? This product, from the Happy Dining series, has been made in such a way that the curvature makes the food stay in the middle of it. The bowl is higher than the usual cat feeders thus offering your cat more comfort when eating. This manufacturer has also thought about the owner’s comfort; therefore, the product can be safely cleaned in the washer and it is also microwave compatible. It also has an inner lip added, so that the spillage issue can be eliminated, compared to the classic cat feeders. A slicker brush is one of the most useful cat gadgets that should not be missing from any home with a fluffy friend. Hertzko created such a brush that can be used to remove loose hair and helps to get rid of knots, tangles or tangles from your pet’s fur. The bristles can groom the fur of your cat deep enough, but without hurting the skin. Moreover, you can also offer your pet a massage, which will increase the animal’s blood circulation for a soft, shiny and healthy looking fur. By clicking one button after brushing your cat, the bristles retract, making the brush very easy to clean. As a pet owner, you have probably confronted with the situation when you had to leave for a day or two and could not find a cat-sitter. From this perspective, nowadays it is quite easy to find a solution for almost everything. In the situation mentioned above, a self-dispensing pet feeder can be the answer you are looking for. The pet feeder uses gravity to ensure enough dry food. The food-storage has an extra-wide opening and a removable lid and can hold up to 6 pounds of food and you can easily notice when the supplies are low, as the storage is transparent. We have mentioned the situation when you have to leave your pet at home, but what about the one in which you can take your cat with you? You will definitely need a cat carrier for safe transportation. The carrier has padding inside, enough ventilation, a handle and also an adjustable shoulder strap, that offers your cat all the necessary comfort. It is also safe, as it holds in shape when the end panels are zipped up. The dimensions are 18”x 11”x 10” which fits most cats and even puppies or other small pets, and it weighs 2.2 pounds. If you have a cat, that means that probably at least one of your furniture items has been used for her or his scratching. Do not take it the wrong way – it is in their instinct, so they have to do it. If you want to spare your furniture, you should really think about getting your furry friend a cat scratcher. This item comes with a hanging butterfly, so it is a great tool for your feline’s scratch and play needs. 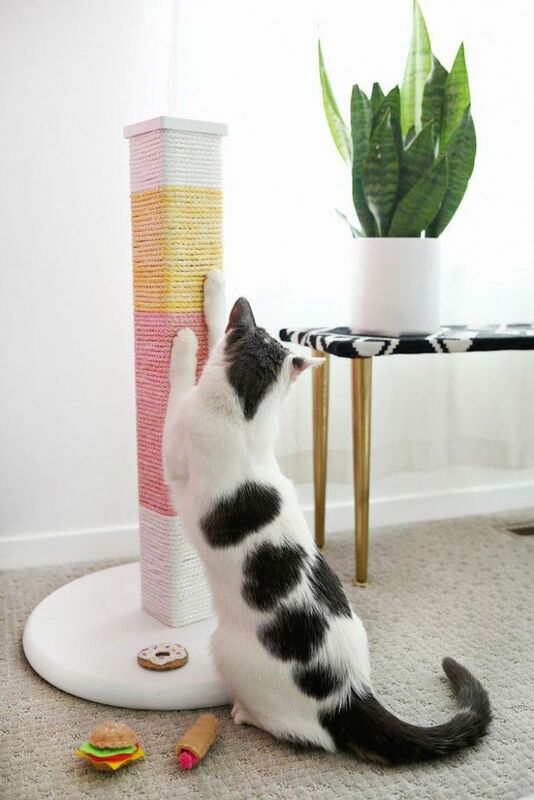 The cat scratcher also has a lookout post for elevated lounging, offering more than one playing, exploring and relaxing environments. It is always amusing when seeing a cat in the sink licking the water tap. But have you ever wonder why cats do this? Well, the answer is simple: they prefer fresh water. As you can imagine, after a few hours, the water from your cat’s bowl is anything but fresh, especially on a hot summer’s day. The Catit Fountain takes care of this issue. The cat fountain does not take much space on the floor and it has a 3L recirculating system with 3 distinct water flow settings, allowing your cat to have fresh water all the time. Having a cat in an apartment with little or no outside contact means you should compensate for as many activity opportunities as possible. A cat tree is one of the options, as it offers your feline friend a great place to climb and jump up and down or to run around. It is also an available place for relaxation when they simply want a good nap. The beige color of the Go Pet Club Cat Tree suits most home designs and it is 38-inch W/ 27-inch L/62-inch H, with a base size of 26 W x 19 L inches – plenty of room for your cat’s activities. In case you are a cat owner or of any other four-pawed pet for that matter and like to travel with your friend, you might think about acquiring a silicone waterproof food mat tray. Bowls come in many shapes, sizes and designs; however, when traveling, these items take a lot of space. The Hoki Found food tray is non-allergenic, non-toxic and safe for pets. It has raised outer lips that prevents food or water for spilling. You can also use it as a bowl or feeder mat. When it comes to cleaning, you can wash it in the dishwasher and it dries up fast. As a human, you certainly want intimacy when using the toilet so why not offer the same benefit? You can get your feline a litter box with a snap-on hood. The box is easily accessible as it comes with a plastic swinging door. The hood also can be lifted for cleaning with no difficulties. One of the issues with litter boxes is the odor your fluffy friend leaves behind. This particular one takes care of that situation with a stain and odor resistant capability; and it’s made of polypropylene plastic. This item also comes with a one year warranty, which gives you plenty of time to decide if you want to replace the classic litter box for good. Raising a cat surely has many benefits, from unconditional love to a trustworthy alarm and a lot of fun. But it also comes with great responsibilities and things that are not so much fun. Cleaning the litter box after your cat uses it is one of those things. That is why a scoop should not be missing from your home. The DuraScoop cat litter unit has a patented design, with a solid metal handle and a molded rubber coating. It is very light for easy handling. The mirror finish will not rub off, and neither will it rust, as it is corrosion resistant. You should also know that it comes in different colors. Having a cat is always fun, yet there are times when you wish you had some things to either make your life easier or help your furry friend be more active and happy. The good news is that you can find some of the best cat stuff online which can provide your pet with toys to play, cat trees for extra physical activity, and more. It’s easy to wish for the best cat things, but a bit harder to figure out what these ‘things’ actually are. Maybe your cat is sitting idle too much and you want to provide it with some form of entertainment. Cleaning the litter could be one thing you’d like to do less often, in which case a modern automatic litter box would be an ideal addition that will spare you from extra work as well as offer your cat with a cleaner alternative. You could also choose from many models of toys, cat condos, treats, and a host of other things that will improve the quality of your pet’s life. You can even spoil yourself with a cat shirt that will make you feel comfy and proud of your passion for animals. While there are lots of alternatives to go for, finding quality cat products can take a lot of time, and in the end, you might not make the best possible choice for your feline friend. Before you buy any product, you may want to learn about some of the best things for cats other owners have tried, as well as understand a few basics about feline care items. The coolest cat things are actually the ones that help your cat stay healthy and happy, as well as the ones that save you time and effort. Toys and cat posts are some of the most sought-after products on the market, with many owners willing to spend a few bucks to improve their small feline’s life. Depending on your cat’s age, breed, and preferences, you might want to choose one product over another. 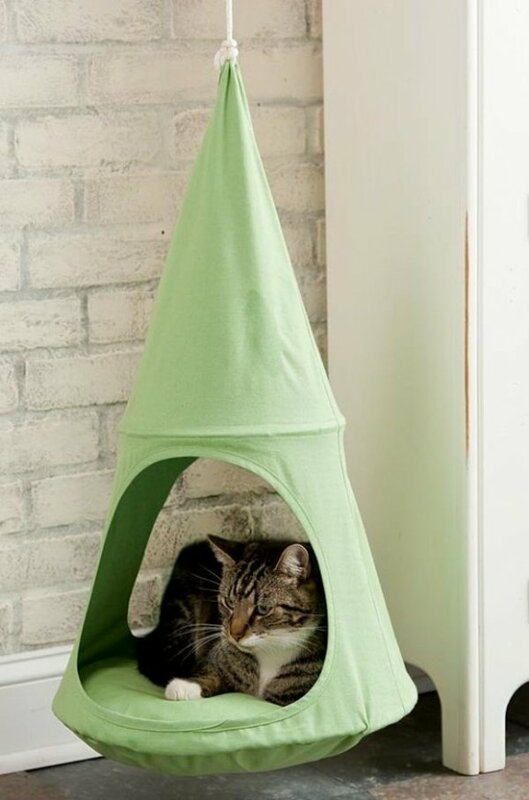 While a young cat will benefit immensely from a set of new toys or jump platforms, an older cat will surely appreciate a remote house a bit more. A fussy cat might be more willing to go take care of ‘business’ in a self-cleaning litter box rather than a simple plastic one. Cats are playful creatures by nature and will probably find many common household items to be interesting. The downside is that cats tend to get bored of “stuff” quite fast, and you’re supposed to keep resupplying the “stuff-stock” to keep your fluffy friend entertained. The good news is that, contrary to regular items you can find lying around the house, many specialized toys you can find for sale nowadays are much more versatile. Some are intended for more than one use, so you can easily turn them into something else and make them interesting again for your cat. Commercial cat toys range from simple balls and teaser wands to laser pointers, chewable critters, robotic mice, and even complex structures with many moving parts which should be able to keep your cat entertained for months on end. Because cats, and especially small ones, tend to bite and chew on just about anything, you might want to ensure that the toy you’re getting doesn’t present a potential choke hazard. Watch out for items that break apart easily, products that can disintegrate into splinters and shards, or stuff that your little kitty might be able to swallow whole. When it comes to getting good things for your cat, nothing beats a solid and comfortable cat tree. You get to choose from cool models with lots of platforms, ropes, and bridges, or simple ones with a small house and a scratching post that provide an affordable solution to your cat’s privacy needs. With a quality cat condo, your cat will be able to jump up and down, exercise muscles, and use a lot of energy. Doing so will not only help improve its health, but also make your cat quieter and less fussy, so when it’s not playing, it will probably just sleep somewhere, perched up above. You will still get the characteristic vocalizations when the cat is hungry, but then again that’s what cat treats and complete foods are for, and you get to select from a huge assortment of types and brands. All cats have the instinct to bury their poop in order to cover the scent, yet some individuals might be particularly pretentious when it comes to the place where they are willing to “go”. With most cats, a simple plastic tray with high side walls should more than satisfy a feline’s bare necessities. However, some cats simply won’t accept using a normal tray, so you could try getting an enclosed litter box to provide the fussy cat with maximum privacy. There are even models with automatic doors which detect motion and open whenever your kitty needs to go to the toilet. Judging by the best cat stuff reviews, you can tell that fully-automatic litter boxes are quite popular. Although more expensive than their conventional counterparts, these units will perform self-cleaning so that you won’t have to scoop the litter again. These systems are also equipped with carbon filtrations systems which are efficient at absorbing unwanted odors. Sometimes, it’s not your cat that needs a reward, but you. For all the hard work you put into making sure that your cat stays entertained and in top shape, you should probably give yourself a treat as well by buying one of the new cat shirts. Doing so won’t just help you prove that you are the proud owner of a satisfied cat, but also keep you warm and cozy. So next time you browse the internet, don’t forget to order a nice cat shirt to show your affection towards these little furry animals.